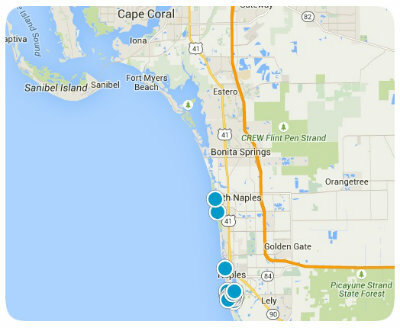 In beautiful Bonita Springs Florida you will find the luxurious community of Spanish Wells. This well established and highly sought after gated community offers potential home buyers numerous options when seeking to buy real estate in the Bonita Springs area. The beautiful homes in Spanish Wells are all luxurious and include features like granite countertops, stainless steel appliances, tile roofs and similar special touches. Nestled in 600 acres, Spanish Wells boasts condos, coach homes, villas, and exquisite single-family homes. There are numerous floor plans to choose from ensuring all home buyers can find a place that suits their personal taste. Home prices range from $360,000 to around $627,000 and condos and villas range from $220,000 to $330,000. Bonita Springs is home to some of the world’s most sought after, breathtaking Gulf beaches. Located halfway between Naples and Fort Myers, just minutes from I-75, Spanish Wells gives home buyers the convenience of easy access to those breathtaking beaches plus all sorts of shopping and dining options with Coconut Point Mall, Miromar Outlets and Gulf Coast Town Center all nearby. There are countless opportunities for recreation and leisure with the multiple golf courses, parks, and other area attractions also in close proximity to Spanish Wells. Residents of Spanish Wells Golf and Country Club enjoy numerous amenities within their community, including a 27 hole championship golf course, Har-Tru tennis courts, swimming pools with breathtaking tropical landscaping, and multiple fitness options. Members also have diverse dining options, whether desiring casual or upscale cuisines. Via boat, they have beach access to Delnor Wiggins State Pass State Park. With all Spanish Wells has to offer, both within and nearby, you would be remiss not to consider this luxurious community when buying a home in Southwest Florida. If you would like to buy a home in Spanish Wells, or you have other Bonita Springs real estate questions, please do not hesitate to contact us today for more information.